While it’s always a good idea to select locally grown fresh produce in season, variety is the spice of life! So we’re fortunate indeed that an unprecedented range of the most sumptuous fruits and vegetables from across the globe are available all year round to complement local produce. 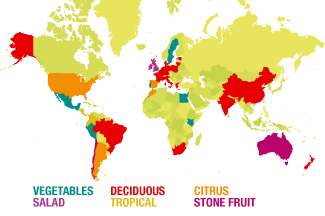 Click on the map opposite to see the primary growing regions of the world’s main fruit and vegetable crops.